Torres del Paine, Chile’s spectacular national park in southern Patagonia, is a wonderland of craggy, granite peaks, snow-clad mountains, glacier-fed lakes, waterfalls and rivers, pampas and thick Magellanic forests, meadows, forests and no matter where you look, fantastic scenery. The name, Torres del Paine, applies to the park, to a mountain range with heights up to 9000 ft and to the set of three peaks recognizable the world over. 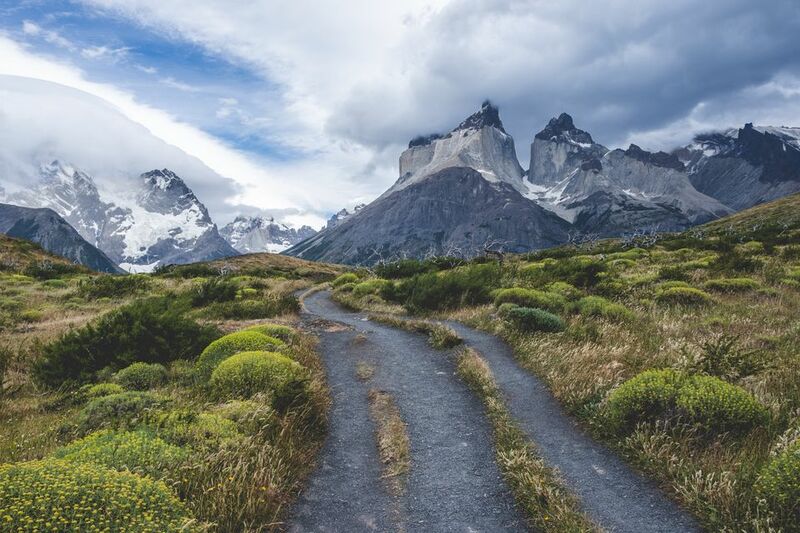 In addition, the Cuernos del Paine at 6300 ft attract thousands of visitors annually who come to trek, camp, mountain climb, hike and ride through the park on any of the numerous trails as well as those visitors who prefer to stay in lodgings and venture out on daily walks. Torres Del Paine National Park is on the southern edge of the Patagonia Ice Cap on the Paine Massif. This mountainous region dates to at least twelve million years. Sedimentary rock and magma met and was thrust high into the air. You'll see Monte Paine Grande (3.050 meters above sea level), Los Cuernos del Paine (2.600, 2.400, 2.200 m), Torres del Paine (2250, 2460 and 2500 m), Fortaleza (2800), and Escudo (2700 m). Some of these are covered in permanent ice. After the ice age, when the ice fields covering the base of the massif began to melt, water and wind carved the rock into huge towers of varying shapes. Crushed rock and sediment colors the lakes in the park. The intense colors range from a milky, almost gray color, to yellows and greens and the intense blue caused by blue algae. Some of the lakes are named for their color, i.e. Laguna Azul and Laguna Verde. There are numerous rivers and small waterfalls and lagoons in the park. The largest rivers are Pingo, Paine, Serrano and Grey. The park, 181,000 hectares on the Seno de Ultima Esperanza, or Last Hope Inlet, was created in 1959 and declared a Biosphere Reserve by UNESCO in 1978. The name "Paine" comes from a Tehuelche Indian word meaning "blue". The Paine Massif is almost completely encircled by the Rio Paine. The river begins at Lago Dickson at the northern edge of the park, then crosses through the Paine, Nordenskljöld and Pehoé lakes and empties into the Lago del Toro at the southern end of the park. Vegetation varies in the park. Around Lago Sarmiento, Salto Grande and mirador Nordenskjöld, you'll find pre-Andean heath. Magellanic forests grace the areas around Lago Grey, Laguna Azul, Pingo valley, Laguna Amarga, Valle del Francés and Lago and Glacier Grey. There are also mosses in the Magellan tundra and pampas of swampy grasses depending on the elevation. Depending on the number of days you want to spend in the park, you can choose from a variety of tours and trekking options. There is a one day tour by car or tour bus which hits the highlights of the park, the Torres, Cuernos del Paine and Lago Grey and Glacier, but it seems that if you’re making the effort to get to the park, it makes sense to spend at least a few days there. Getting there isn’t as complicated as it used to be, but it still involves getting to Patagonia. The park is located 150 km from Puerto Natales, located on the Seno de Ultima Esperanza. Puerto Natales is a typical fishing town surrounded by mountains and close to the border with Argentina. The park is 400 km north from Punta Arenas on the Strait of Magellan. Most people fly to Punta Arenas and then take the bus to Puerto Natales, but if you have the time to take the ferry through the fjords from Puerto Montt or Chaiten to Punta Arenas, you’ll add another dimension to an unforgettable trip. You can fly to Punta Arenas from Santiago, or get there from points in Argentina. The park has three entrances from the east: Lago Sarmiento, Laguna Amarga, most often used from Puerto Natales, and Laguna Azul where there are guarderias, ranger stations, maintained by CONAF, the keepers of Chile’s national parks. From the west and south, there are guarderias at Lago Pehoé, Laguna Verde, Lago de Grey and the main headquarters, or Administrative Center, are on Lago del Toro. Each of the guarderias can provide camping and trekking information for any of the trekking circuits. Check the distance and average trekking time for each portion of the trail and estimate the time you'll need. The trails may be well marked or rough tracks as they cross a variety of terrain. You’ll walk through pampas and thick Magellanic forests, along lakes with huge glaciers and icebergs, up and down steep hills, but no matter which trail you take, you’ll have excellent views. As noted, visits can be day trips or longer. Camping is not necessary to stay within the park. There are refugios, hosterias, lodges and hotels within the park. Many provide transfers from the airports, shuttles, tours, and boat docks and all have views. Reservations are definitely recommended. You can combine camping with lodgings as some of the tour packages provide. If you plan a visit based on camping and trekking, there are at least a dozen campsites within the park located on the 100 km of trekking circuits. The weather in Torres del Paine park, even in summer, is changeable and unpredictable. Wind is always prevalent. Rain, sleet and snow can follow a day of bright sunshine in spring or early summer. Even in summer, there are strong winds (up to 80 km/hr) and rainfalls. The average temperature in summer averages around 11ºC/ 52ºF ( 24 ºC max, 2ºC min). During summer, there are 18 hours of daylight which gives you plenty of time for walking and enjoying the views. The autumn months are a good time to visit the park. Torres del Paine park is an all-season destination and is open all year, however winter visitors must be ready for inclement weather. Trekkers and backpackers should have experience with rough country, and climbers must have experience with ice and snow climbing. Be prepared for bad weather to interrupt your itinerary. Flexible planning is necessary. Remember to pack out all your disposable items. Camping gear can be rented in Puerto Natales, where there are many suppliers. This saves you having to lug equipment during the rest of your visit to South America. This climate and clothing reference provides more information. On the west side of the park, open meadows are home to 110 species of birds, including guanacos Andean geese, great grebes, buff-necked ibis, southern lapwings, plumbed rails, black-chested buzzard eagles, rheas, ñandues and black-necked swans. Everywhere in the park, you may see eagles and condors soaring about the mountain peaks. You might also see some of the 25 species of mammals in the park area. There are pumas, gray fox, the chingue patagonico, huemules, reintroduced into the park after near extinction. Depending on your time, physical fitness, interests and weather, you'll have choices. The circuits have varying grades of difficulty and may take you less or more time based on your abilities and the weather. Touring with a guide is recommended if you're not familiar with the terrain and weather conditions. Trails may change without much notice. The W Circuit is the smaller route and can be done in four to five days. The route takes in the three most famous features of the park, the towers, the Torres, the Cuernos del Paine and Grey lake and glacier. It’s called the W because each of the treks goes roughly from Lago Nordenskljöld (the base) into the mountains and ice fields, then back to the base and up again, three times. Day 1: From Guarderia Lago Amarga, take the bus to Guardería Lago Pudeto. See Salto Grande while waiting for the launch, or ferry, Tzonka across Lago Pehoé to Refugio Pehoe. From there, walk to Lago Grey, and set up camp at Refugio Grey. The beach there is white and sandy but swim only if you’re a penguin. Day 2: Sightsee at the glacier. Return to the refugio at Lago Pehoé and walk to Campamento Italiano and set up camp for two nights. The upper campsite is usually less crowded. Day 3: Backpack to Campamento Britanico from where you can climb up to a viewpoint and see the Torres from the southeast, as opposed to the usual view towards the southwest. Day 4: Walk along the northern bank of Nordenskljöld to the Hostería Las Torres. Along the way, you can veer north to Refugio El Chileno along the Rio Ascensio and on to a small lake just below the Torres del Paine and the three fantastic granite towers. Stay overnight at the refugio. Day 5: Walk to the Hostería Las Torres for your last night in the park. Day 1: From Refugio Las Torres, hike to the foot of the El Paine massif for a view of the torres. Day 2: Trek the lake Nordenskljöld trail to Refugio Los Cuernos for an overnight stay. Day 3: Hike via Campamento Frances to Campamento Britanico with views of Glaciar Frances. Continue past Lago Skottsberg to Lago Pehoé for an overnight stay at Refugio Pehoé. Day 4: Trek to Lago and Glaciar Grey with a stop at the lookout point, Mirador, to see the towering walls of the glacier and the icebergs drifting in the lake. Stay overnight at Refugio Grey. Day 5: Back to Refugio Pehoé, then take the launch back to the bus at Pudeto to exit the park. 7 Days Torres del Paine Circuit, about 80 Km, Grade 3, or moderate. This trek is a circle tour, starting at the western edge of the park, going north, then east and south to return to the starting point to avoid some of the winds and leaving the hardest treks to the end. Day 2: On a 4x4 vehicle, drive the old estancia track for an off-road trip via Rio Paine to Lago Paine, then walk to Lago Dickson for an overnight stay at Refugio Dickson. Day 3: Backpack along Rio Los Perros to Glaciar Los Perros for an overnight tent Campamento. Day 4: Climb up to paso John Garner (1.300 m) for a panoramic view of the ice cap. This is the highest point of this circuit. Continue on to Lago and Glaciar Grey with a stop at the lookout point, Mirador, to see the towering walls of the glacier and the icebergs drifting in the lake. Stay overnight at Refugio Grey. Day 5: After viewing the glacier up close, trek, with the support of pack horses, to Refugio Pehoé for an overnight stay at the refugio. Day 6: Hike via Campamento Frances to Campamento Italiano and Campamento Britanico with views of Glaciar Frances. Overnight stay at Refugio Los Cuernos. Day 7: Trek back to Refugio Los Torres and exit the park. 9 - 11 Days Torres del Paine Grand Circuit Grade 2. Allow extra time for weather, sightseeing and lingering along the track for photographing the spectacular scenery. Day 1: From Hostería Las Torres, near Laguna Amarga entrance, cross the river over the bridge and continue to Campamento Serón for an overnight stay, crossing meadows and taking in the views of Laguna Azul to the east. Day 2: Walk to Lago Dickson via Campamento Coirón, with views of Lago Paine and the towers and Paine mountain range. Overnight tent stay at Campament Dickson. Day 3: Trek through the forest to Campamento Los Perros along the Rio Los Perros with views of Dickson lake and glacier with the north face of the Paine Massif. Tent overnight with a view of Los Perros glacier. Day 4: Slightly tougher trek from Los Perros to Campamento Grey via Garner Pass through a swampy area, crossing the Rio Paso, and up to the pass. The descent is through a forest of lenga trees with views of the Southern Ice Cap and Grey glacier. Tent overnight at Campamento Grey. Day 5: Spend the morning seeing Grey glacier, then hike to Campamento Pehoé over easy terrain. Day 6: Day hike, via Campamento Britanico, into French Valley, considered the most beautiful valley in the park to see hanging glaciers, granite cliffs and the peaks of Espada, Hoja, Mascara, Paine Grande, Aleta de Tiburón, Catedral and more. From here, the views of the Cuernos del Paine are truly spectacular. Return to Camp Pehoé. Day 7: Trek along Lago Nordenskljöld for dinner and overnight stay at Refugio Los Cuernos. Day 8: Continue along Lake Nordenskljöld with its views of the hanging glaciers of Mount Admiral Nieto, to Refugio El Chileno in valley Ascencio for an overnight stay. Day 9: From Refugio El Chileno, hike to the base of the three towers: Torre D`Agostini 2850 m, also named Torre Sur, Torre Central 2800 m and Torre Norte 2600 m, also named Torre Monzino. Return to the refugio and to the Hosteria Las Torres to exit the park. Seeing the park on foot or by car aren't your only options. Horseback rides are a popular way to see some of the areas where trekking trails don't exist. One tour agency, Cascada Expediciones, operates the full Paine circuit trek in Patagonia with horsepack support and offers optional porters support for your personal belongs, allowing you to carry only your day pack. No matter when you go or how long you stay, follow the park's regulations, make allowances for crowded or intemperate conditions and have a marvelous journey. To get to Torres del Paine, check flights from your area to Santiago and other locations in Chile. You can also browse for hotels and car rentals.